So, anyone that knows anything about Seattle knows that the Seattle coffee shop is an iconic image that won't ever be replaced. Coffee and Seattle are inseparable. It's impossible to imagine one without the other. The first time I visited Seattle, I was struck by two things: First of all, I was amazed at how green everything was. Secondly, I didn't realize just how many coffee houses there were in Seattle. There's no way to know exactly just how many Seattle coffee shops there really are, but a quick search on Google Maps shows that there are at least over 10,000 separate shops. Houston, with almost four times the population of the city of Seattle, only comes up with just over 6,000 coffee shops. Even then, ten thousand coffee shops is still a pretty conservative estimate for one of the world's Coffee Capitals. 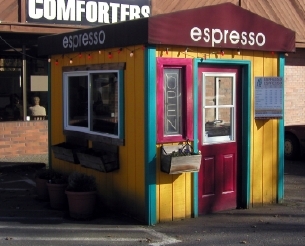 So what makes up those 10,000+ Seattle coffee houses? Well, that's one of the great things about Seattle. There are all kinds of coffee shops that make up that number. You've got a number of well-established and well-known chain shops like Starbucks and Tully's. At the same time, you've also got a lot of independent shops on street corners and in grocery store parking lots run by one or two people, or some great out-of-the-way places like Canal Street Coffee in Fremont. So what makes a good coffee house? Trying to decide on what makes a good coffee house is like trying to decide which sports team is the best. There are a million different opinions and there's no way you'd ever be able to convince someone to change their mind. But even so, because there are so many coffee shops in Seattle, you're bound to find at least one or two that fit what you might need in one. The first thing, though, is to decide what exactly it is you need. Are you someone that is looking for a drive-through shop to grab on your way to some Seattle attractions, or do you need a place to go and relax and maybe take a couple of hours to enjoy your hot drink? If you just need a place to quickly grab something, you'll have a million different choices to choose from no matter what hotel in Seattle you're staying at. However, if you're looking for a place to sit back and relax and finish that novel you've been working on, you'll want a place that has plenty of outlets for your laptop, wireless internet access, and of course good food and drink. A great resource for finding a Seattle coffee shop that has wireless internet access is to check out Caffeinated and Unstrung, a site that has a listing of a bunch of wireless coffee shops in and around Seattle. What's great is that people also post their reviews of the different places. This can be a great way to find a place near wherever it is that you'll be staying on your trip to the region. Back from Seattle coffee shop.